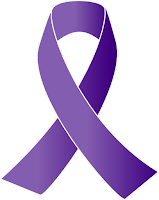 Today is Purple Day® for Epilepsy and World Epilepsy Day™. 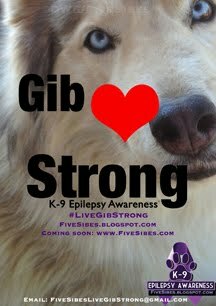 As many of you loyal readers are aware, my Gibson was, is, and always will be my inspiration behind our FiveSibes #LiveGibStrong K-9 Epilepsy Awareness campaign and Canine Epilepsy advocacy. 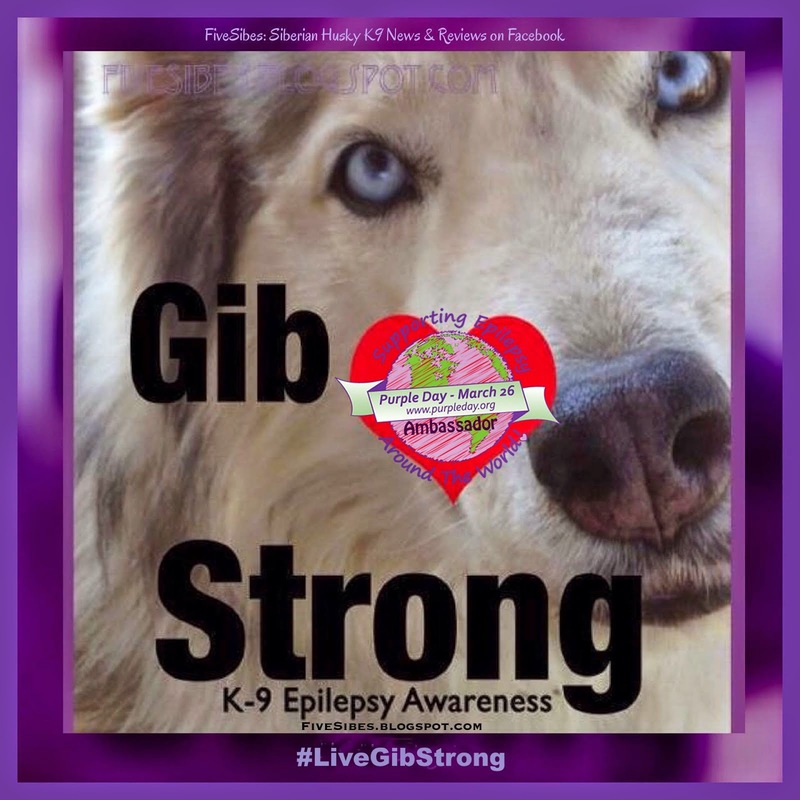 Here is a short video that will help explain it all...but know, it's credited to a 9-year-old girl named Cassidy Megan who wanted to have a special day for others like herself, who live with Epilepsy, to know that people around the world care, and there should be no stigmas or fear attached to Epilepsy. 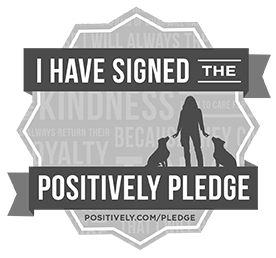 I whole-heartedly agree, and want to add the very same goes for our canine companions. Please take a moment and watch the video if you have not yet had the chance to view. 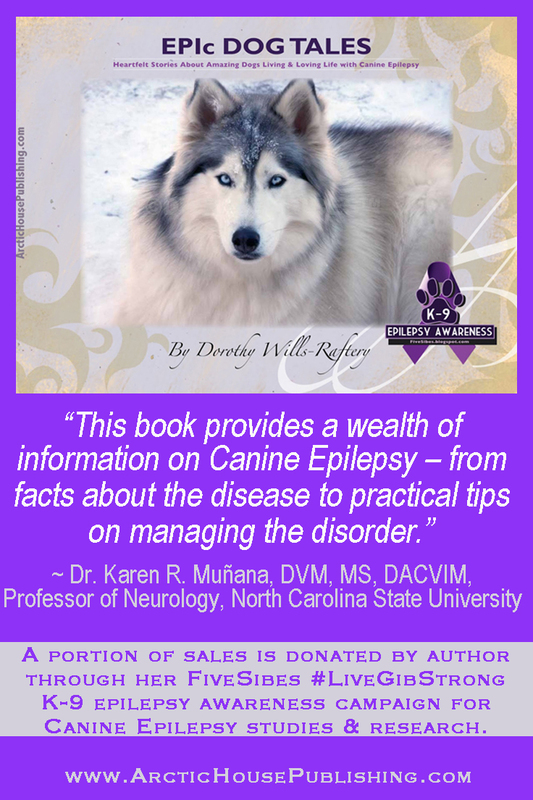 And be sure to check out the end credits for a condensed list of Canine Epilepsy informational resources. 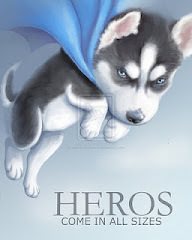 (A more extensive list is in my book, EPIc Dog Tales). 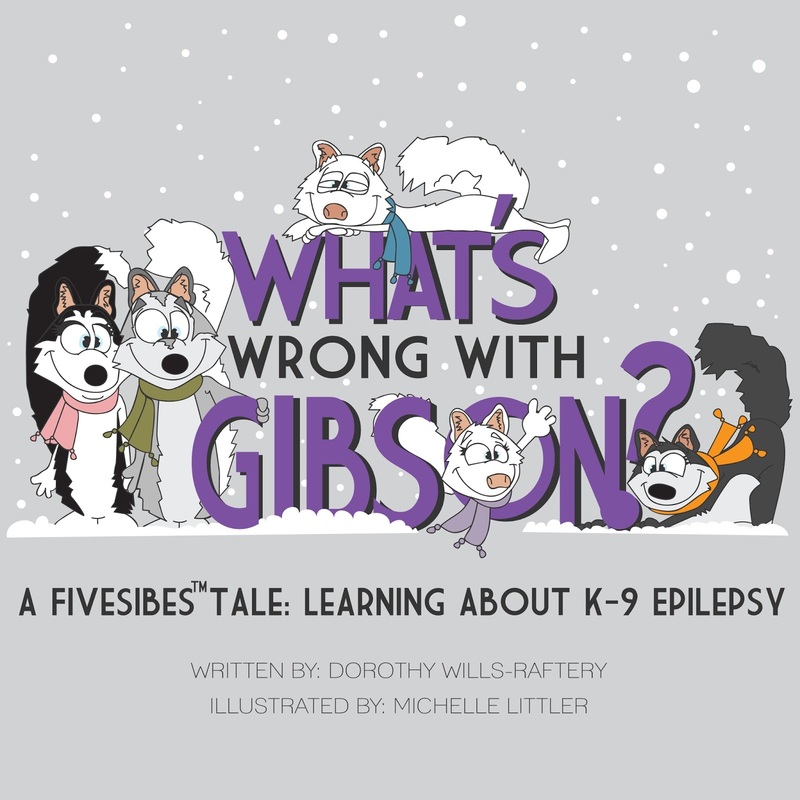 For my new readers, and to recap, Gibson was diagnosed shortly after his third birthday in 2009. 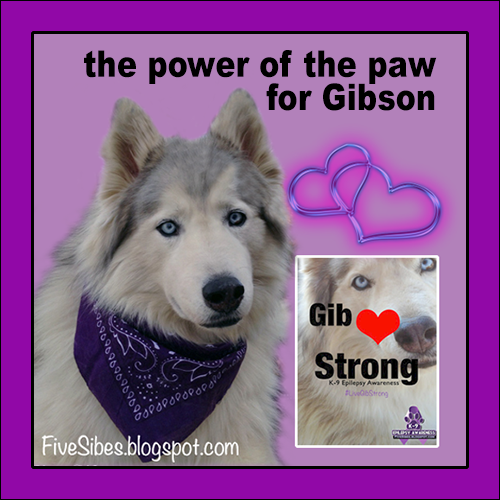 I have written much about our journey together over the years, sharing our experiences, Gibson's amazing determination and his constant rehab from side effects due to the Epi-medications, as well as stories of other Epi-dogs, adoptable Epi-dogs, and valuable information on seizures and Canine Epilepsy. My beautiful wooly warrior boy who loved to talk, give me Gibbie kisses, do the Gib hip-hop dance, and have an understanding and connection with me second to none. Our bond was unbreakable. There was no road too rough for him to travel, if I asked. He was feeling wonderful...just rehabbed (again) from weak hind issues and a fall on the ice, and was back to running and feeling good...and then one night, he collapsed. Not from seizures, but rather from the sneaky beast called cancer. 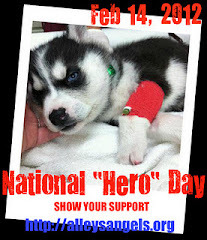 Hemangiosarcoma to be exact. He fought gallantly for a week, with home care and IVs, but when he went in for surgery on his bleeding spleen, the cancer was discovered, and it metastasized, including a hidden orange sized tumor. 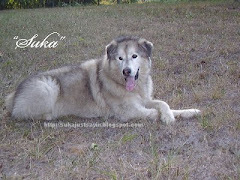 So... my brave, beautiful, fluffy spirit guide, slipped peacefully on to his next journey. He will always be by my side, and as I always say, he is proof that dogs with Canine Epilepsy can and do live full, happy lives for however long we are blessed to have them. Gibson sure did. Gibson inspired me every single day. I learned that when the going gets tough...keep going. Just like he did. I became an official Purple Day Ambassador in 2012, and joined The Wally Foundation as a volunteer case manager to help guide and support others who have dogs with seizures. 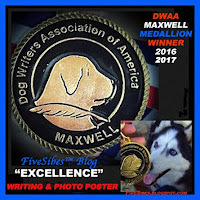 He was the spark behind both of my books on Canine Epilepsy that I wanted to write to help others understand and not be afraid. 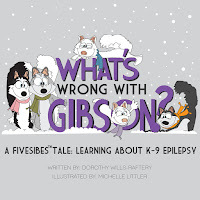 Through my books, the illustrated children's FiveSibes Tale, What's Wrong With Gibson? 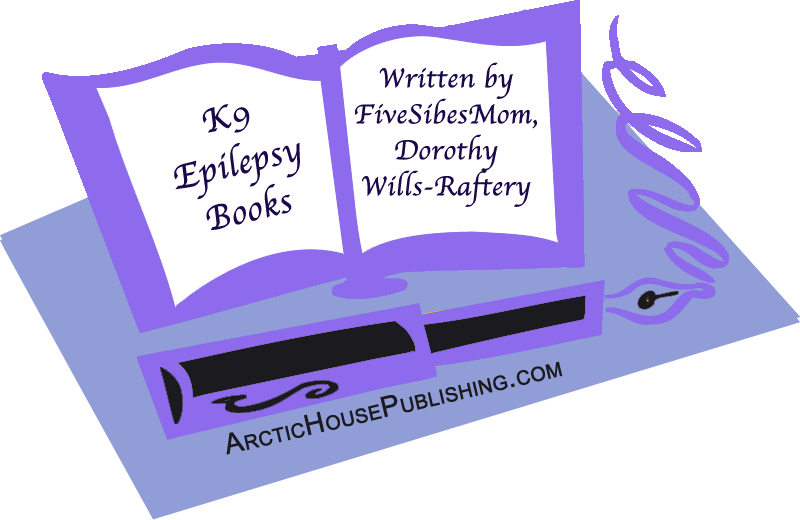 Learning About K-9 Epilepsy and my EPIc Dog Tales: Heartfelt Stories About Amazing Dogs Living & Loving Life With Canine Epilepsy (ArcticHouse Publishing), and our first benefit auction, we have raised over $3,200 for Canine Epilepsy research and assistance. Since I pay for all the work on my books myself, and for the publication, I am so proud that we were able to make these donations to day, and that is also thanks to all of you who helped support this cause by purchasing* the books! 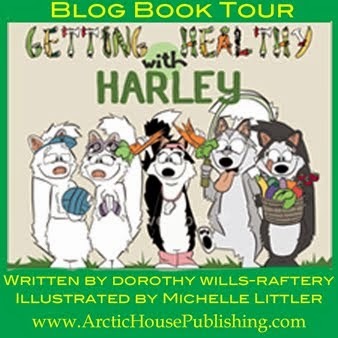 *Books are available through ArcticHouse Publishing, with links to Amazon. Please always be sure on Amazon that the seller is ArcticHouse to be sure you have us! A portion of my books will always be donated to the Epil-K9 Foundation, home of the Epil-K9 List and Canine Epilepsy Resources, for the "Emma's Seizure Fund" at the North Carolina State University's College of Veterinary Medicine. What Are We Doing For Purple Day? 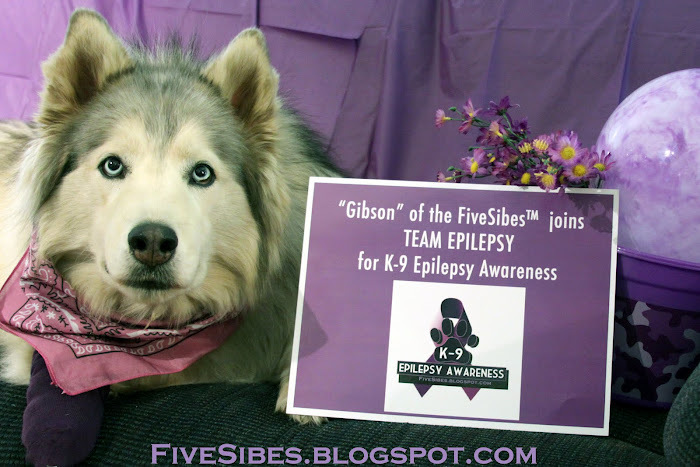 I am proud to announce that here at FiveSibes, in Gibson's honor I am hosting our 3rd Annual FiveSibes #LiveGibStrong K-9 Epilepsy Awareness Purple Day Blog Hop to promote awareness and help support both humans and canines (and horses, cats, and bunnies) who live with Epilepsy, and to let them know they are not alone in their journeys. 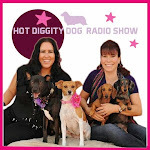 I am pleased to pair up with co-hosts and fellow Epi-dog hu-moms, Kimberley Matchem and her handsome "Rolo" from Confessions of a Rescue Mom and Jeanaann Barnaby and beautiful "Olivia" from Knotty Toys for Good Dogs. Grab our badge down below, follow the linky directions below, and let's show the world our purple! 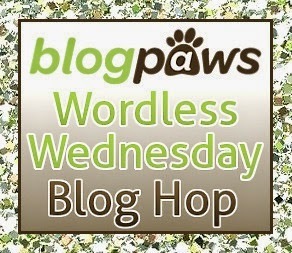 The Blog Hop will stay open until 11:59 PM EST on March 31st, so spread the word! Today, I am also taping the newest episode of my show "The Sibe Vibe" on Dog Works Radio and in honor of Purple Day, my guest is Margit Maxwell, trainer and canine behavior specialist for Siberian Huskies and Malamutes, and an Epi-dog parent. 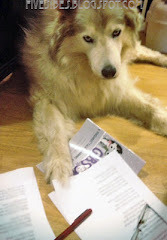 Margit is also the author of The Divine Dog Project on Facebook. We will be discussing the important correlation between zinc deficiency and seizures on today's show. You can tune in live HERE at 1 PM EST. If you can't join us live, I will be posting the permalink here after the show so you can check back and listen in at your convenience. 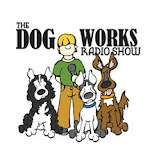 It will also be available on iTunes under the Dog Works Radio family of shows. A K9 Epilepsy Book Giveaway! 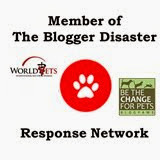 Raising Funds to Help Epi-Dog Families! 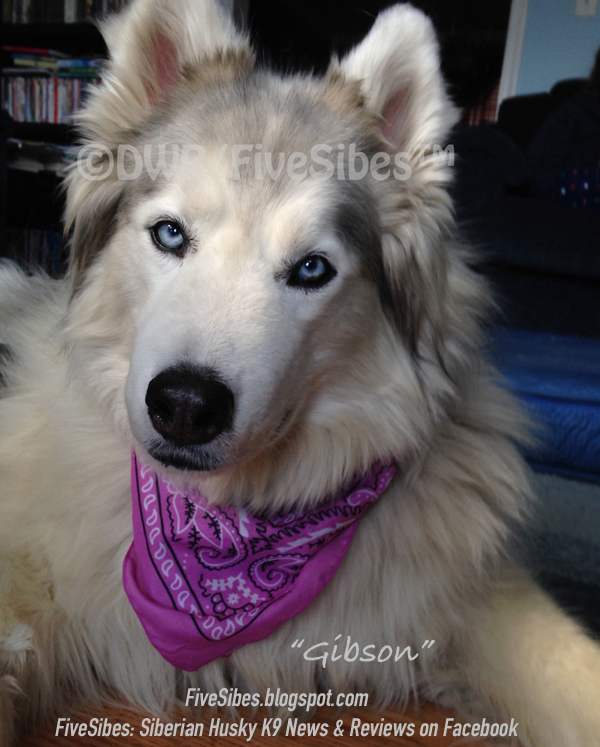 And...don't forget about Gibson's namesake "Gibbie Snacks" from House Woof Dog Biscuits in Vermont. 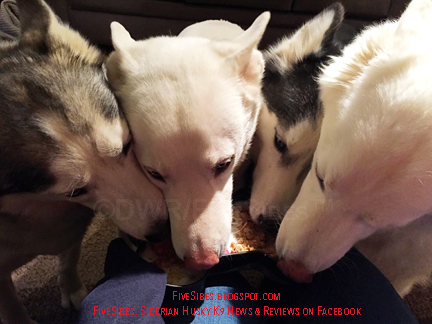 They were his favorite treat and were created by the chef and nursing masters at House Woof based on Gibson's diet and with the nutritional diet of the Epi-dog in mind. 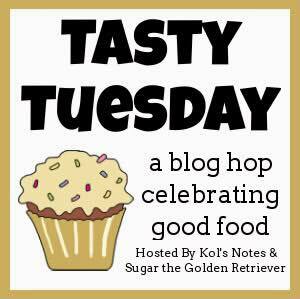 No preservatives, salt (important for Epi-dogs who may be on Potassium Bromide), or rosemary - ever! Just organic ingredients such as beef puree, cooked green beans, carrots, sweet potatoes, fresh parsley, and oatmeal. Yum! 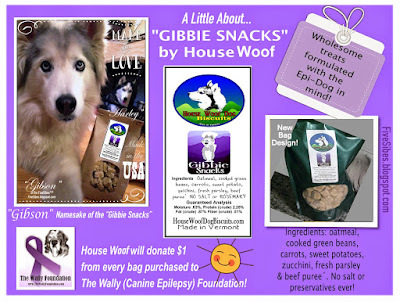 And as if it couldn't get any better...House Woof donates $1/bag purchased to The Wally Foundation~Canine Epilepsy, a non-profit organization that offers possible financial assistance for much-needed medications to families, rescues, and fosters of Epi-dogs. 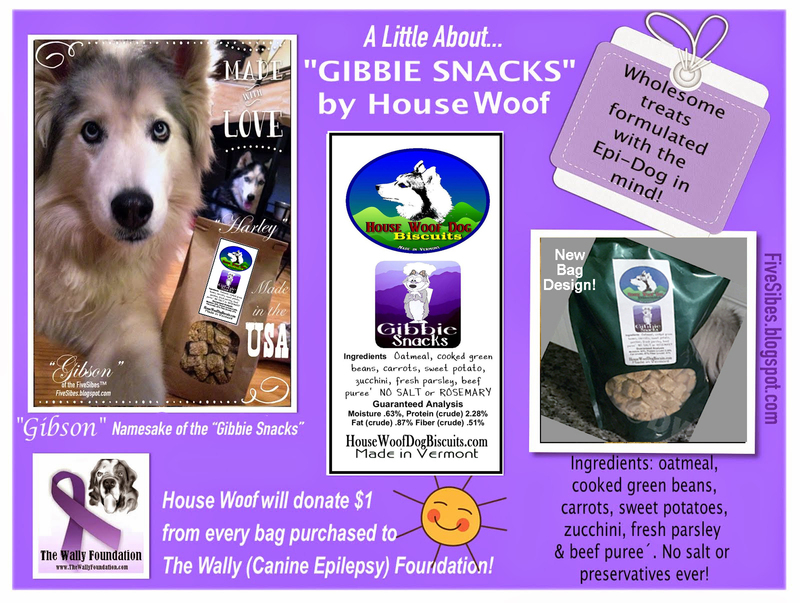 To find out more about Gibbie Snacks, visit HERE. And Co-Hosting a Facebook Event! 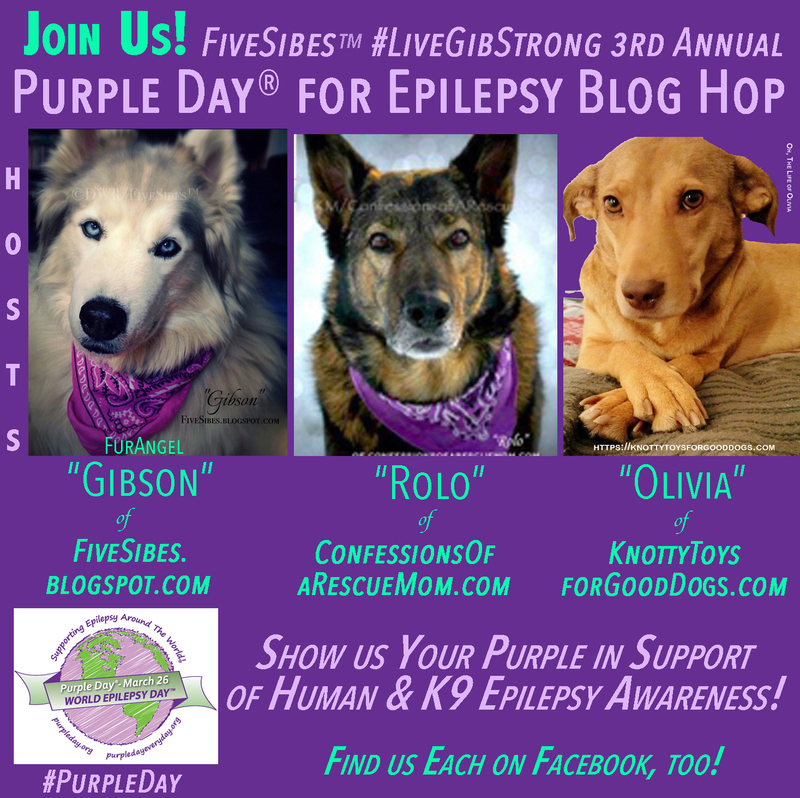 We'd love for you to share your Purple Day pics with us over on our Purple Day for Epilepsy 2017 Facebook event page HERE, also hosted by FiveSibes, Confessions of a Rescue Mom, and Knotty Toys for Good Dogs! 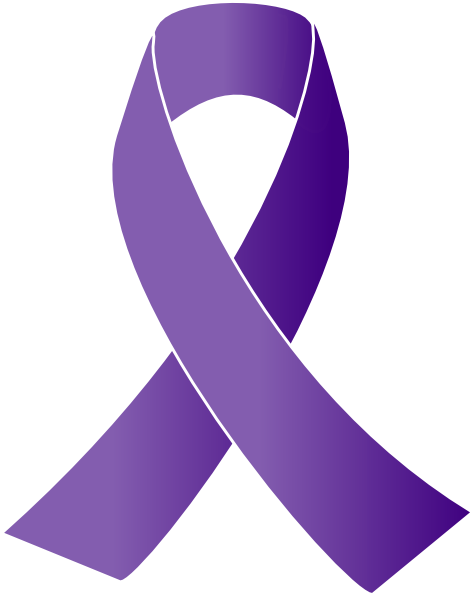 For more info on Purple Day, please visit www.PurpleDay.org ~and~ www.PurpleDayEveryDay.org. 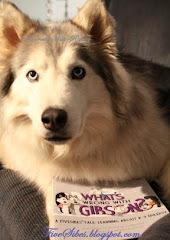 What are You and Your Pet Doing for Purple Day? Please tell us in the comments below, and join in our Blog Hop! Time to Hop! 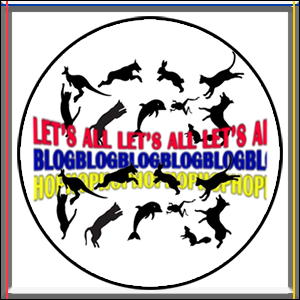 Grab Our Blog Hop Badge! 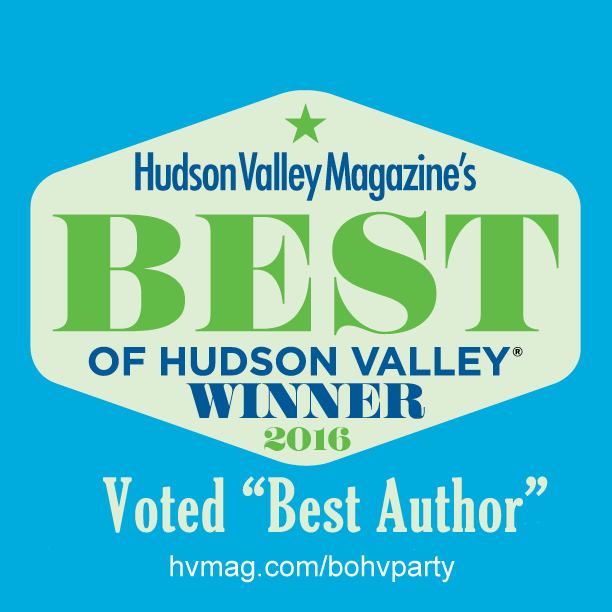 And please be sure to link to us! 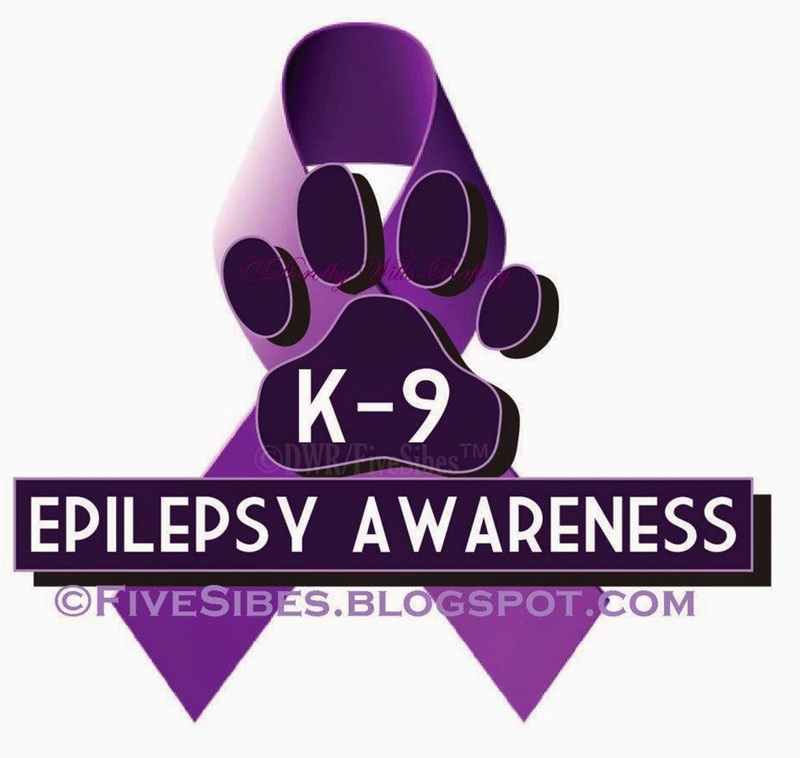 Thanks for joining us in spreading the word that dogs who live with Epilepsy are amazing...and they can and do live happy lives! 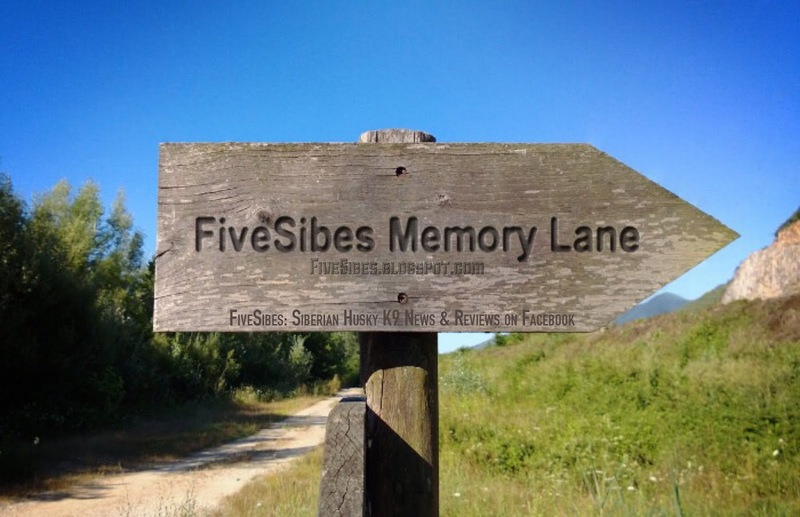 Spring Has Sprung on Memory Lane on a #FiveSibes Flashback Friday! It's almost hard to believe after our big blizzard, that almost all of the two feet of snow has now disappeared, and just four days ago, we welcomed in the first day of spring! Time sure does fly. 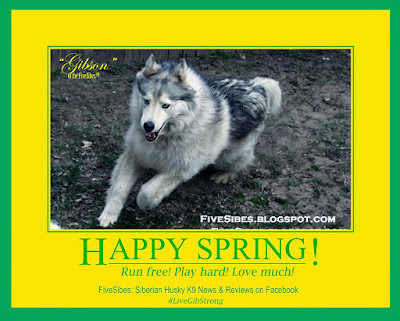 Above is one of my favorite action photographs of my furangel Gibson, taken one spring long before his weak hind end issues began. He ran freely ahead of the pack, so full of happiness and joy as he felt the new spring in his every step! 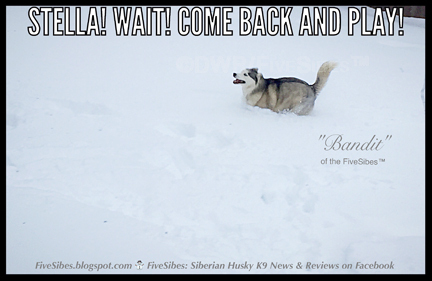 Ah, this is a dog's true happiness, and mine to behold such a sight! How I miss those days, but am so grateful I have them embedded in my memory for all days, pulling them out like a book on a shelf, to relive and smile at all over again. Please don't forget our upcoming FiveSibes #LiveGibStrong 3rd Annual Purple Day® for Epilepsy Blog Hop this Sunday! 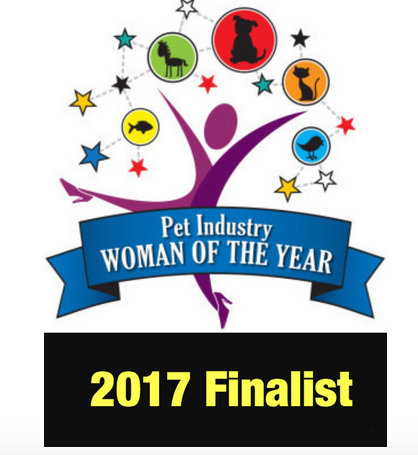 This year I am joined by co-hosts and fellow Epi-dog hu-moms, Kimberley Matchem and "Rolo" of Confessions of a Rescue Mom blog and Jeanaann Barnaby and "Olivia" of Knotty Toys for Good Dogs. 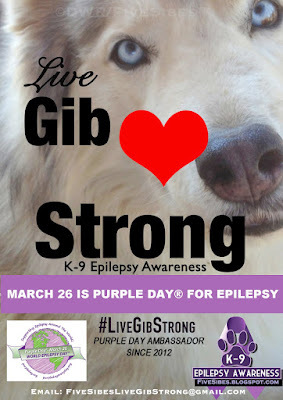 We hope you and/your beloved pet will don something purple and show your support for humans and canines (and horses, cats, and bunnies, too) living with Epilepsy. Details HERE. 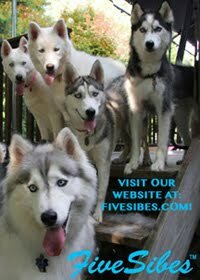 Flashback Fridays are brought to you by us - the FiveSibes - and now also our co-hosts, Love is being owned by a Husky each Friday. We hope you'll find a photo or video from Memory Lane, post it, and link up to our blog hop each week! 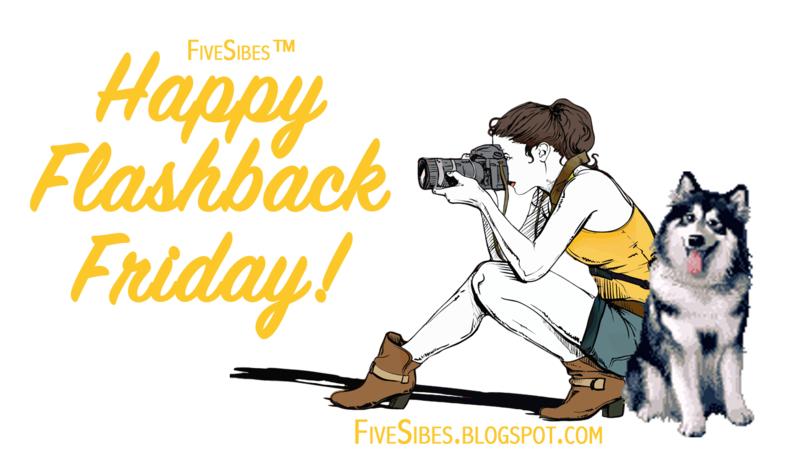 If you don't catch it on Friday, you can link up any time during the week! We are also joining in the Pet Parade, hosted by Rascal and Rocco, Bionic Basil’s Blog, Love is being owned by a Husky, and Barking from the Bayou. Pop by for some spring fun! Join Our FiveSibes #LiveGibStrong 3rd Annual Purple Day® for Epilepsy Blog Hop! Purple Day® is almost here! 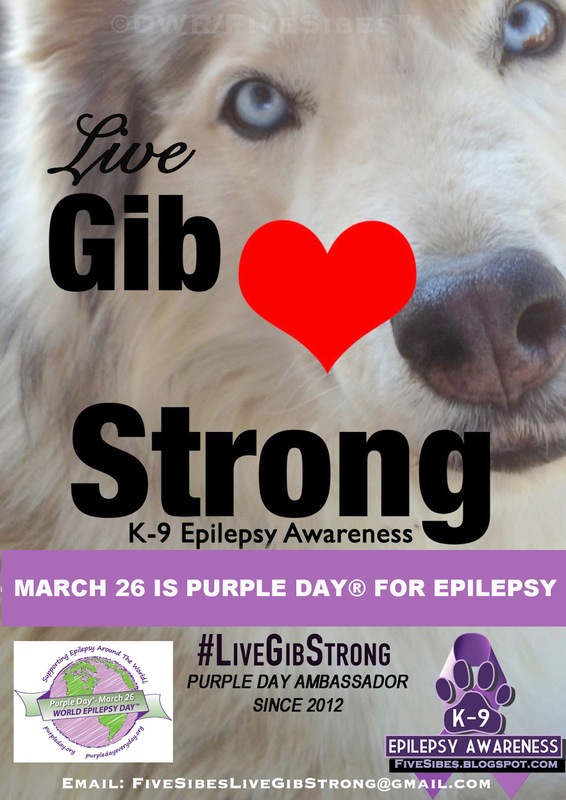 As part of our #LiveGibStrong K-9 Epilepsy Awareness campaign, on Sunday, March 26, Purple Day for Epilepsy we will be hosting our 3rd Annual FiveSibes #LiveGibStrong Purple Day for Epilepsy Awareness Media Share & Blog Hop! 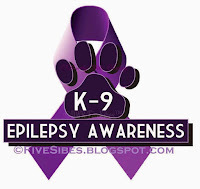 Purple Day is a is the time to show your support for Epilepsy (Human, Canine, Feline, Equine) awareness by wearing purple, baking something purple, turning your social media purple, etc. 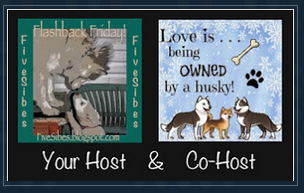 This year, I am pleased to announce that my co-hosts are fellow bloggers and Epi-dog hu-parents, Kimberley Matchem and her handsome Epi-dog “Rolo” Confessions of a Rescue Mom blog and Jeanaann Barnaby and beautiful "Olivia" of Knotty Toys for Good Dogs. What Is Purple Day All About? Then, all you have to do is post the photo on your social media, blog and websites, link up to our special Purple Day Blog Hop (link will be posted on March 26) and help us make it go viral! 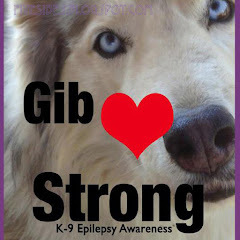 The more folks that know about Purple Day and Canine Epilepsy, the more Epi-dogs and their families that we can help! 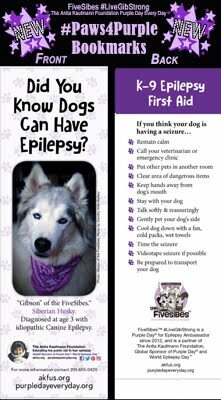 They are not alone and there are plenty of informational resources available to help guide them on their journey with a dog who has Canine Epilepsy. 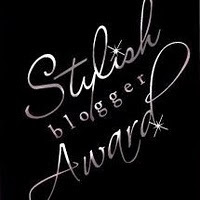 Simply right click on badge and copy! 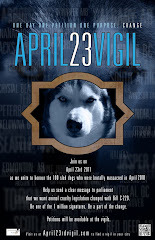 Please join us and post our badge on your March 26 Purple Day blog post, and include the link so others can see your post and you can visit other blogs as well! We'll be sure to share with Cassidy Megan, creator of Purple Day, and The Anita Kaufman Foundation! 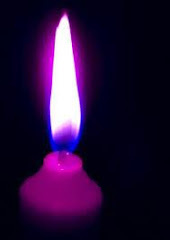 Come on now, let's show the world our purple! For more info on Purple Day, visit www.PurpleDay.org and www.PurpleDayEveryDay.org. 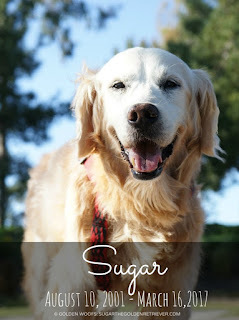 Today, we bid a golden farewell to an icon in the blogging world - Sugar, the Golden Retriever, star of Golden Woofs. 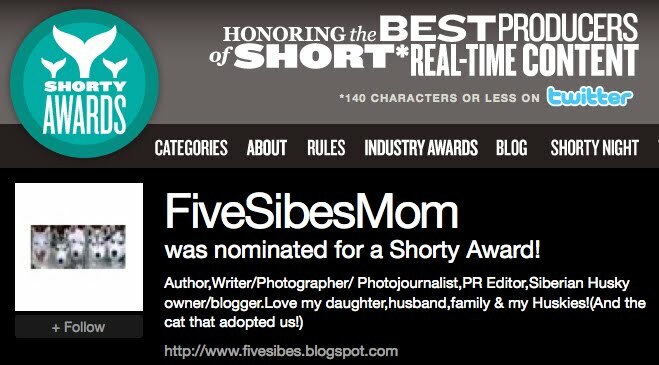 It truly is a sad time here in Blogville when we lose a friend. 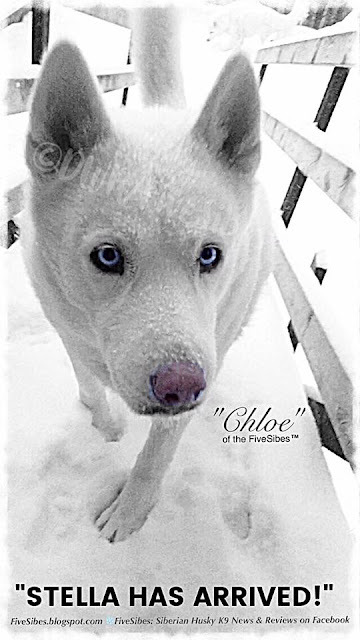 While we may be a virtual community, our friendships and support for each other are true; both in good times and sad times, we are there for each other as most of us know all-too-well the deep sadness from the loss of a very special furry best friend. It is through such loss, that we can reach out to support another who is going though one of life's most heartbreaking times. I wish us all only happiness and "beautiful moments" with our beloved furkids, but, alas, we know that is not how the cycle of life goes. 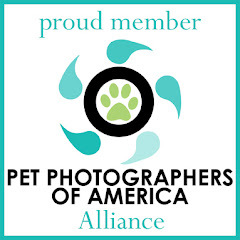 So let us all always embrace all those moments with our beloved canine companions, however many we are blessed with. Sugar, you brought us all so many smiles of happiness and pure golden moments over the years. 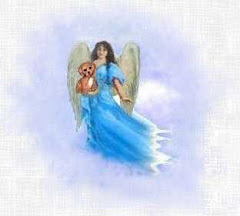 May you be sharing all of your Golden glow with the furangels beyond The Rainbow Bridge. 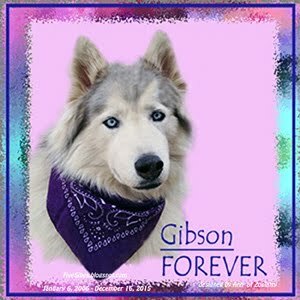 Please give my sweet boy Gibson one of those precious beautiful Sugar smiles for me. 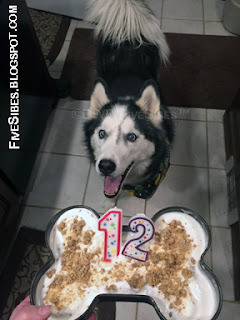 He was a big fan of your treats! All of them! I had the pleasure of interviewing Sugar's mom, Rosalyn, as part of an article on healthy eating I wrote for Hudson Valley Paw Print Magazine, where she shared one of those fantastic Sugar treats, Banana Coconut Dog Pancakes, with the readers. 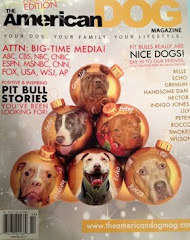 This is the issue featuring the recipe, that is on page 14. 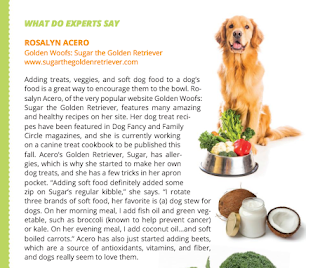 To view my article, "Adding Some Healthy Zip to Your Dog's Meal Time," featuring Rosalyn's expert advice, along with Sugar's recipe, click HERE. The article starts on page 8. "Best friends live forever in the memories we keep." Run free, sweet Sugar, and be forever Golden. 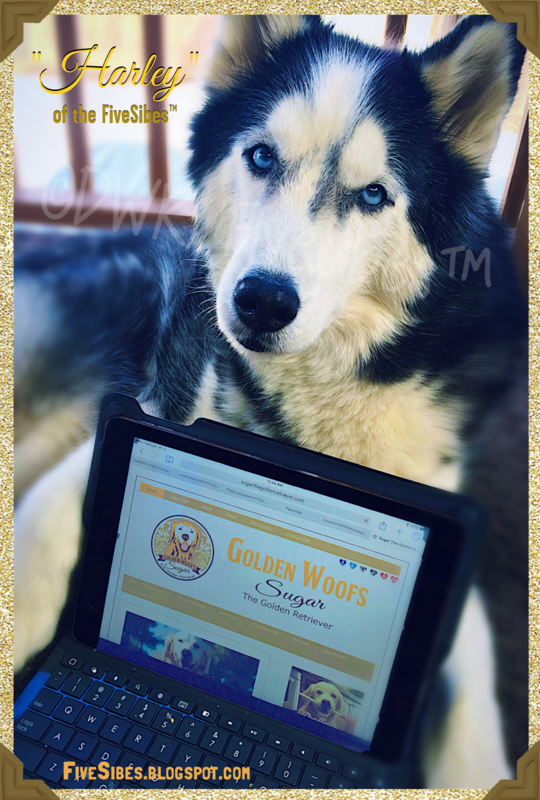 Please stop by Sugar's Golden Woofs blog to leave your condolences and fond memories. 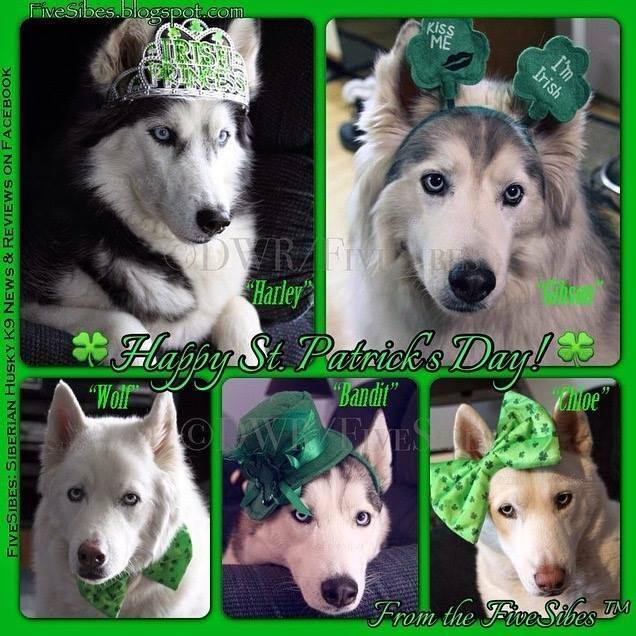 FiveSibes Siberian Huskies Feelin' Sibe-rish on St. Paddy's Day! 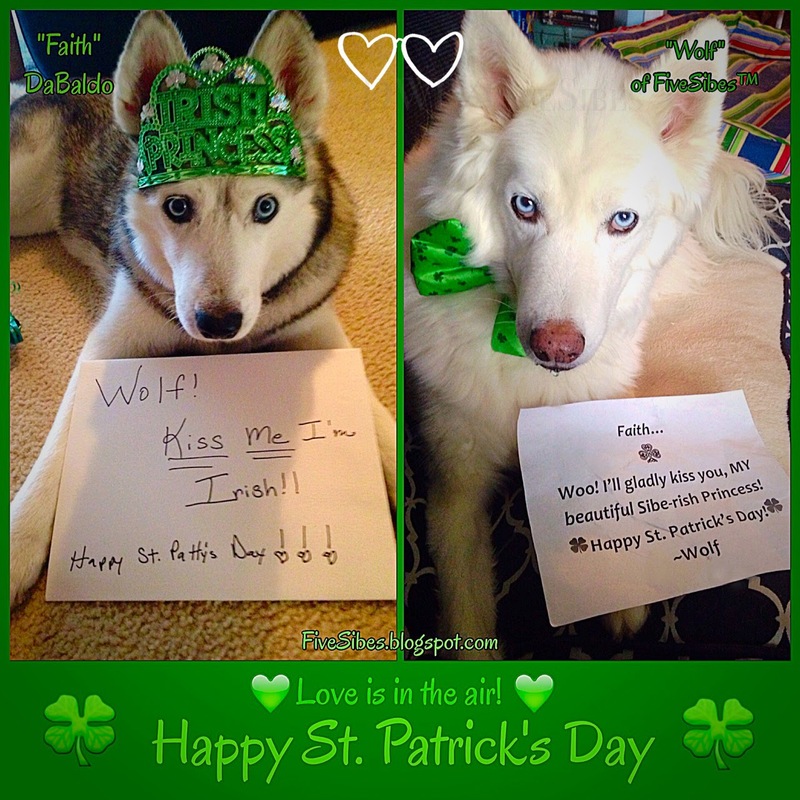 We sure hope you are all having a howlin' good St. Paddy's Day! 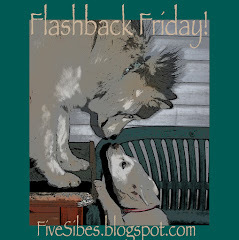 For my Flashback Friday, I'm sharing my all-time favorite collage of my FiveMcSibes! 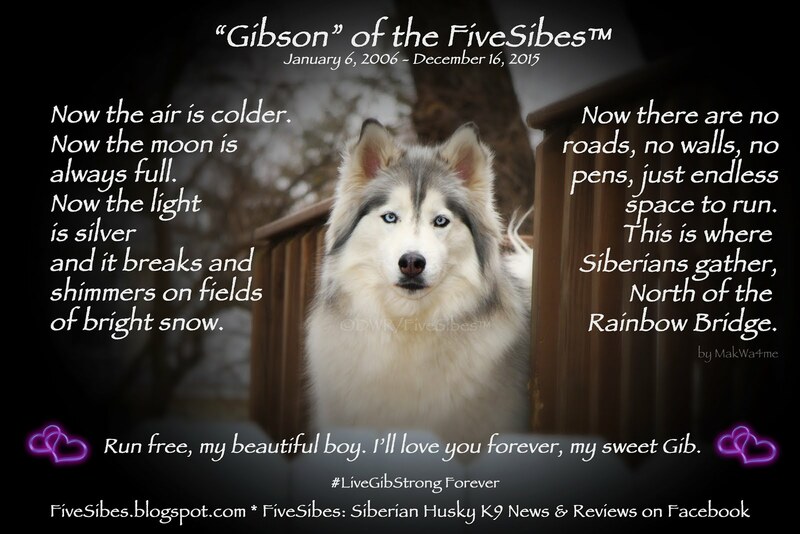 I love looking back at all the special times and remembering my boy, Gibson. 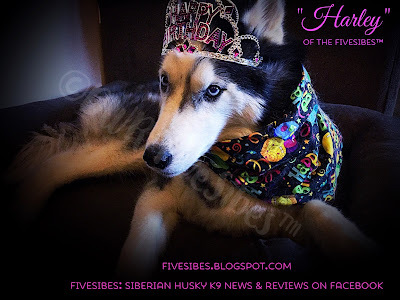 Be sure to stop over at our FiveSibes: Siberian Husky K9 News & Reviews Facebook page to see some cutie Sibe-rish lass and lasses and keep up on our latest Husky news! And our trip down St. Patrick's Day Memory Lane continues with these two Sibe-rish sweethearts, my dear friend Jeanette DaBaldo's beautiful Irish princess lass "Faith" of Snowdog Appreciation Group on Facebook, and our very own FiveSibes laddy, "Wolf!" Could they be any cuter?! 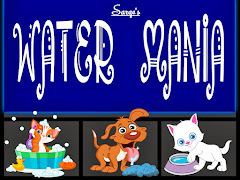 For sunlight after showers ..
We are also joining The Pet Parade! 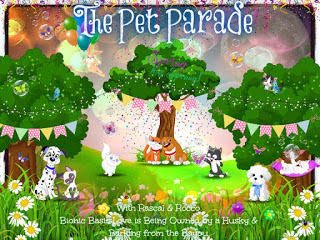 Please be sure to pop over to the hosts Rascal & Rocco, Bionic Basil, Love is Being Owned by a Husky, and Barking From the Bayou blogs to visit all the pet stories on parade! The Northeast's blizzard of 2017 named Stella is in full swing here at our FiveSibes homestead! Updated prediction: 20" to 36" of snow! If Stella is visiting you, please stay safe everyone! 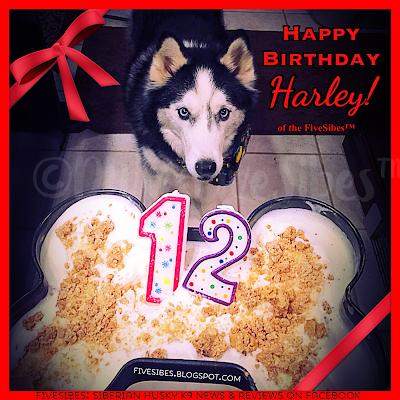 All Hail the Queen: Happy Birthday, Harley! 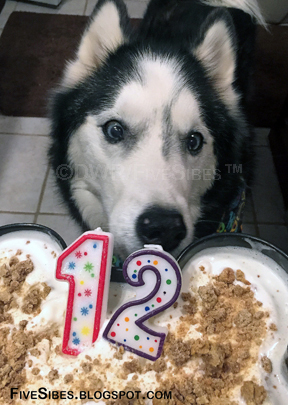 Our beautiful blue-eyed alpha queen Nanuk "Harley" Mari turns 12 today! Wow! 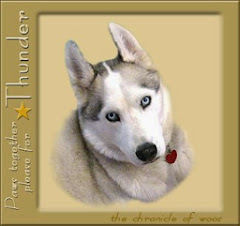 I can hardly believe it was a dozen years ago she first entered our hearts and home as a 7-week old pup! 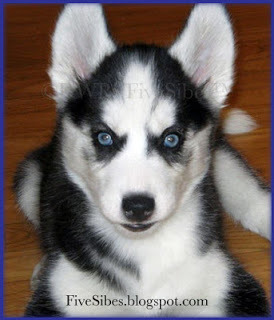 My daughter always wanted a Siberian Husky, and I have to thank her for introducing me to the breed! 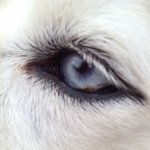 We drove an hour south of where we live to check out the stunning black and white, blue-eyed puppy and it was instant love between her and my daughter. I remember on the ride home, it was a torrential downpour! 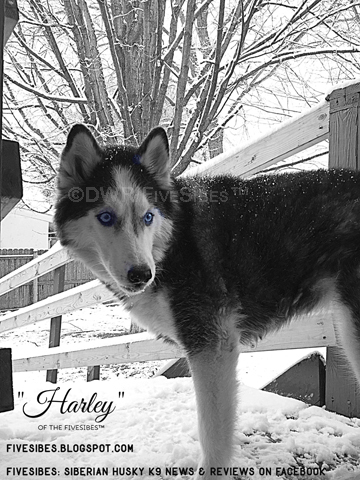 But Harley didn't mind. She climbed up by my daughter and fell asleep as the water came down in sheets against the rear car window! 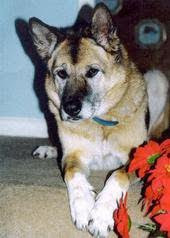 I think someone has not told Harley her real age, for (thankfully) she thinks and acts like she is still a pup! What's age after all, but just a number? 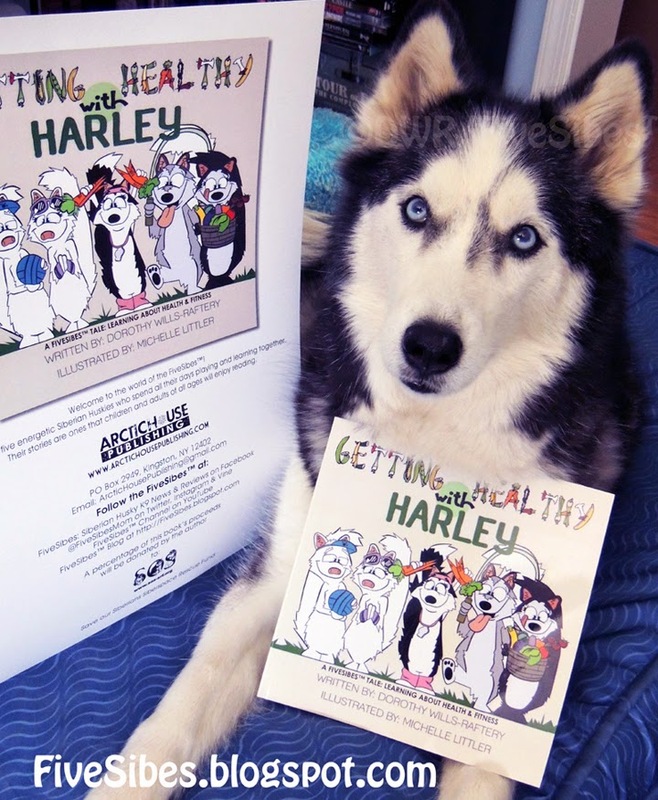 Full of sass and Husky attitude, Harley is an exceptionally smart dog. Sometimes too smart! She loves to sit and listen to our conversations and will join in occasionally! She has the pack's worst voice when howling, but the rest of the pups convinced her that her voice is beautiful, so she proudly howls away in a voice that sounds more like an injured animal rather than a singing one! Honest. Even our neighbors checked to be sure everything was okay after hearing that sound (her voice) for the first time. She is petite at 48 pounds (compared to our others), with little ladylike paws, but she is strong and can body slam you with the best of football players, literally leaving you breathless! She loves pizza "bones," ice cream, and licking my (paper) plate clean of buttered blueberry muffin crumbs! As sweet and charming as she can be, she is also dubbed "Snarley Harley" for you never want to wake this girl from a sleep! 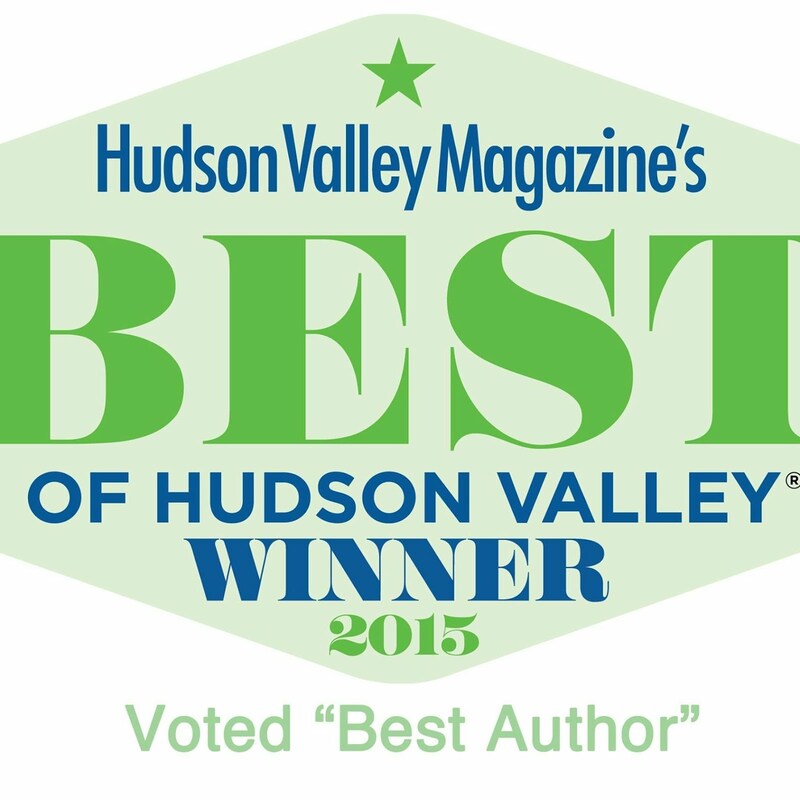 She loved snuggling up against her true love, furangel Gibson, and all his wooliness. 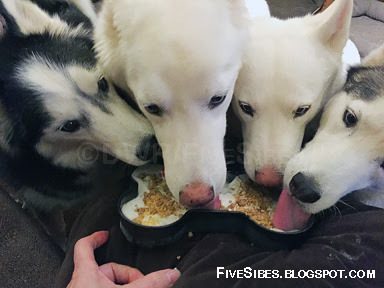 It never ceases to amaze how nine years ago she took the three Pupsters under her wing and became their surrogate mom, loving them and teaching them the Husky way as if she birthed them herself. FiveSibes™ Tale, Getting Healthy With Harley. And, while she is not a cuddler, she enjoys a good back scratch, and loves to play! Her favorites are a good game of Fetch, Tug o'War, and our very own "Slide-the-Sibe" (a game we made up when she was just a pup, where I stand with my legs apart, pat my thighs, and she rushes through them, then turns, chases her tail, play growls, and charges back to do it all again)! While she gave us a recent health scare (I'll be posting about that soon), I hope that we have many, more years with this amazing gal! Harley, we sure do love you! One of the best parts of any birthday is the cake, of course! 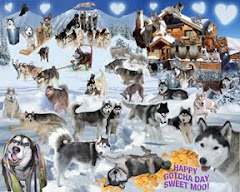 And not just for the Birthday gal, but for the whole pack! Nom-nommms! (May not play on all devices). Her very best gift today came from Mother Nature herself! Several beautiful inches of fresh, white snow. 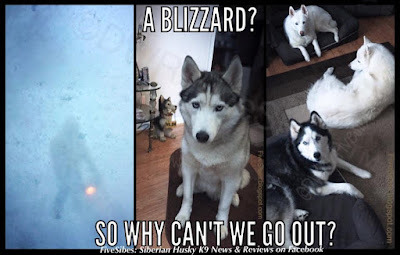 A Siberian Husky's dream!